Yes. Absolutely 100%. I would definitely be interested in the XY option as well. Where can I preorder? Give it a day or two, so I can gather more responses. Then I’ll talk it over with my partner (that does all the PCB design and such). If it seems like we have enough momentum behind this idea, then we’ll put up a pre-order product and move forward. Thanks! By the way, if anyone would want to post about this on https://www.reddit.com/r/RetroPie/ or https://www.reddit.com/r/Gameboy/ (or anywhere else), I’d really appreciate it. I feel odd about self promoting something like this. If you do post elsewhere, please leave a link to that as a comment here. Thanks! I subscribed to get updates and it seems things are lively here. Are there kits available, and I also saw you mentioned the potential for a 4 button option. Is that something in the works? I ask because that is what I’m interested in purchasing. What we would likely do for X/Y is build it in as just that (an option). There are a few reasons. 1) It requires you to drill holes in the GBA shell, and some people may want to keep that original look/feel. 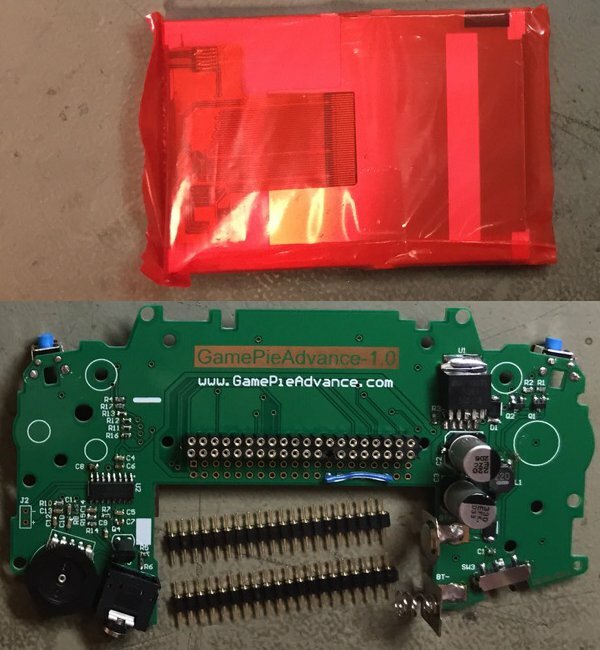 2) It requires a separate small PCB under the Game Pie Advance PCB. This is our solution to the problem that there is no room on the main PCB for more buttons. 3) It is somewhat untested in that we have proven that it can work (drilling, cutting, and soldering by hand), but we haven’t proven that it is something we can manufacture. If it turns out perfect on the first try, we may just be able to include it as part of the base kit and let makers add it to their build if they want. If it doesn’t, then it may be an add-on that you can pop in later once it’s perfected (like if we need to redesign the sub-PCB). Also, keep in mind that the way we are doing it is with tactile buttons (because they are small enough to work in the confines space). These will not have the same feel/response as the A/B buttons do with their rubber pad. I would be interested in an X/Y option. Also would love and R2/L2 as well if possible. Maybe just using some simple tactile buttons and 2 small holes to drill under where the R/L are. Oh, and there are not currently kits available, but if we get a good response here in the comments, we will likely go ahead with letting people pre-order kits ASAP. there are some questions in there for you. Yes I would like to preorder at least two. Glad you guys are still at this, I was working on my own mod when I came across this project. I’d definitely buy a kit! I would be in for some parts. Would you sale pcbs separately for example? Outside of a kit. At this time, I think we’re just doing the kit. But the kit is mainly just the PCB (with everything soldered on) and an LCD. The kit doesn’t come with batteries, the shell, or the Pi. I love the preorder idea. I posted a pic of one of your builds to a group I am in and it seemed like a good 20people where interested enough to make a purchase. The post got a few hundred views and about 130 likes. I want one, this looks really great! Count me in for your preorders! I have always loved that GBA form factor and to have a RetroPie machine in a QUALITY case with buttons (by using a genuine GBA case) would be perfect. Hell, I would even love the possibility for the thing to run off AA batteries… I know it’s probably not possible but it would add to the longevity of the device and if you’re travelling you can stop anywhere and get some new batteries. My original GBA is modded with the SP lcd with backlight, and it’s my favorite handheld. Anyways…yes, instant pre-order from me, so add me to a newsletter or something. I actually looked into regular AA batteries and they don’t supply enough power to run a pi by itself sadly. So it couldn’t do the screen and speaker either. So, AA could work if we boosted them up to 5V. Implementing a battery charging circuit would do this just like the Adafruit 1000C does this for the LiPo battery. The lithium batteries are rated at 3.7v (run in the 3.5-4.4v range), so they get boosted up to 5V. So, AAs could work in series (1.5v + 2), but it wouldn’t be a simple swap from one technology to the other. You’d have to modify the circuit if you wanted to go to AAs. I’ve seen people do this by putting the 2 AAs in series with a diode to prevent the circuit from trying to charge them. As an interesting aside, the RPi Zero can actually run from a pretty low input voltage. Most of its functions run off of 3.3v or less. In our early design testing, we did this. It works fine to power it off of a 3.7v source, but then the USB functions are likely to fail, as USB devices expect 5V from the master. So, in a closed system (if you didn’t allow USB devices or an external power source), then you should be fine running the PiZero directly from a lithium battery. I would get another kit, but on the condition of both the charging and the X/Y parts being present. so I have been waiting I would love a x y version BUT I CANT WAIT SO EXCITED. Subscribed! I’ve got the Zero, GBA, another GBA case and the tft screen. I just need something to tie it all together with ABXY! It sounds like you’re prepared. Our kit would come with the TFT screen, because it relies on the exact LCD chip. pls how can I find out about this when I can buy??? If you sign up here, the website will automatically email you when there’s a new post. Expect something in a day or two. I feel pretty confident that the response here is great enough to warrant our moving forward with this idea. I just need to see some more people comment, and then I’ll present this as a discussion with the circuit board guy. I think this will be evidence enough that he’ll agree to make this a priority. If you can cram an X and Y button in there, I’m definitely getting one ! I’m definitely excited. Pre-order idea is a good Plan! I had an idea just now that we might want stickers to go on our GPA systems. When you buy a reproduction GBA shell, they often come with a serial number sticker (that goes on the back just above the battery compartment). I’m no graphic artist, but if someone wanted to design a sticker that perfectly fit that space, I would definitely consider having them printed and adding them to the kits. I could also (MAYBE) see a sticker that would go on the front and cover the “GAME BOY ADVANCE” or “NINTENDO” markings that come on the front of the LCD surround and shell. See http://gamepieadvance.com/wp-content/uploads/2016/12/IMG_7792.jpg as an example of how the GBA shell reproductions come. id be interested in taking this on for you. do you see the email that i enter when making the comment? feel free to reach out to that one and we can talk more. Yes! I am definitely interested and I would love to get one if it integrated the recharging of the batteries like you say. Also as an extra side note. What would be the possibilities of getting/modding some sort of game cartridge to cover the back where the cable input ports are. Just an idea to sleek up the look of it. I’ve considered this. I just haven’t put any real thought/testing into it, yet. One thing we will likely do is move the Pi Zero “down” (back further into the cart opening) a little bit in the new version. In theory, this might make a modded a game cart fit easier. I don’t really know for sure, though. I think a maker could also cut up (and glue) a GBA cart shell in such a way that it becomes part of the GBA shell and only leaves openings for HDMI and Micro USB. I was thinking of cutting a broken game and sticking it in via magnets so you can easily access the ports of the PiZero still. Once my kit gets here tomorrow it is something I will be experimenting with. Van update you in a few days. Was thinking about putting “Gameboy Pi Advance” on the cartridge. I would definitely be interested in pre-ordering one of these! I would preorder if the X/Y option was available. This is an awesome project! Gamepieadvance is very very very very great thing. I would like to preorder at least two. I hope that day will come soon. I would definitely be interested in a preorder! There has been enough interest to push ahead with the pre-order, so I’ll be setting it up ASAP. I don’t know if that will be this weekend or Monday. For anyone that wants to pre-order and hasn’t commented, it would still be helpful to do so. For preorder, how long will you be having it up? I get paid soon and wanna be sure I get a preorder in! I would love to order a second GPA like I said if the charging circuit is put in. I like X/Y as well and possible more headers or spots for other inputs and outputs built into the board. Okay Wesley, I just added the GPA pre-order product page. I worked on this yesterday, but I wasn’t planning to post it live until I was ready with a post here. I don’t see it hurting anything to put it up now, though. Please take a look, and let me know if there’s anything that should be changed/added/etc. I don’t recall what I have the HDMI set to for sure, but it’s settable if you want to play around with it. I think I settled on 1024×768 or some other very common setting. One issue is that you need to fix the resolution (instead of autodetect the monitor), because most of the time you are booting with no HDMI attached. The LCD is 320×240. IIRC, I think it’s set to 60fps. I think I tested down to 24fps, but for most emulators it seemed to make little difference. It uses FBCP to clone the HDMI output to the LCD. I just added the GPA pre-order product page. I worked on this yesterday, but I wasn’t planning to post it live until I was ready with a post here. I don’t see it hurting anything to put it up now, though. Please take a look, and let me know if there’s anything that should be changed/added/etc. I think the page is perfect. One question for you though. I remember you saying that you might want to start including 2 14500s in the kits? Do you think that will be possible on the next production? At one point, I was considering this. It becomes fairly problematic for several reasons, though. This new kit will not rely on 14500s like the old one did. The idea now is to allow people to use the 14500s if they want, but I think some people will prefer the flat lithium packs. I’d rather let people get whatever battery they want elsewhere. Another large problem is shipping lithium batteries. Different countries have different regulations. I think it’s better/easier/cheaper to just get whatever cells you want directly from eBay or whatever retailer you prefer. Please tell me you can get these to the UK and I will order a few for the whole family..
Yeah, Rob. Check out http://www.flashmasta.com/product/game-pie-advance-diy-kit-v2/ and you should find a suitable shipping option. Thanks! Any ideas when they may be available? Well, here’s my thoughts on that. In less than a week from now, I think we can order circuitboards. We’ll leave the pre-order unlimited until then. At that point, we’ll order more than enough to cover any presales made up until that point. If we pay to upgrade the shipping, then I think we can get the boards back in less than 2 weeks from the time we order. Let’s say that’s 3 weeks to be on the conservative side. We can order the other parts to match that shipping time. If everything goes well (and estimates are correct), that would mean we can start testing and then assembling the kits in 3 weeks from now. That could take a week. Will everything go well? I think it’s a good probability that it’ll go well. If things don’t go well, that would likely mean that we need to re-order circuitboards (or some other part). That would be a 2-3 week setback just waiting. thats great.. Thank you very much.. Does the kit right now include the charging battery and x/y buttons? I am very much interested in buying if it does. If not, when will those features be available? I plan to do a proper post about this in a day or two. We just got the boards in, and we’ve soldered up a couple for testing. Charging seems to be working well, but I’d give it a day or two more for us to try a few more battery combinations. The X/Y option will come with the preorders. It will, however, be an option for you to decide if you want to put it in your build. I know some people don’t want to change the “feel” of their console, and others may not like that the X/Y feel different than the A/B. Will you be doing a second lot for preorders I’ve missed this one? feel so sad as this is what I’m looking for! At the moment, I can’t really say more, because we’re in the middle of making/shipping the preorders. I can not wait, I want one, it’s a fantastic project !!! I am with Robert. Just discovered this. I am interested in the next batch. Well, I hope you subscribed. I plan to post some news rather soon. Thanks!